Electronic circuits with touch sensing is more Interactive to the user than traditional electronic circuits. Few electronic elements only available in the market with high sensitivity and high reliability. Here the IC AT42QT1012 from Atmel is in the top preferred list to us. 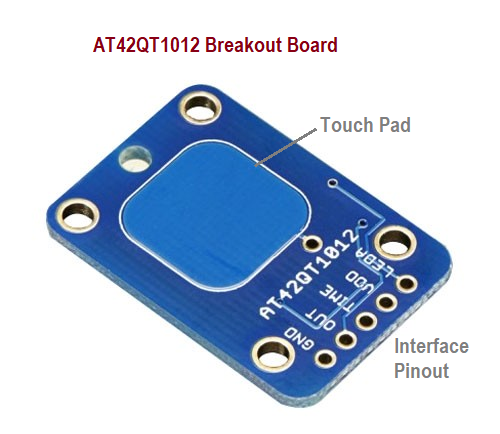 The AT42QT1012 is an one channel toggle mode touch sensor IC with power management functions. It can be in toggle mode (touch -ON/ touch -OFF), or programmable auto delay mode, this IC designed specifically for touch controls. If can be employed in circuit with few easy to avail components, and this device can suit almost any product needing a power switch or toggle mode controlled functions. The AT42QT1012 is a digital touch sensor IC with one channel toggle mode function. It provides stable sensing under wide variety of changing conditions. AT42QT1012 available in 6 pin SOT23-6 package and 8 pin UDFN / USON package. Here we have used 6 pin package IC, and all components tested in this circuit are SMD components. 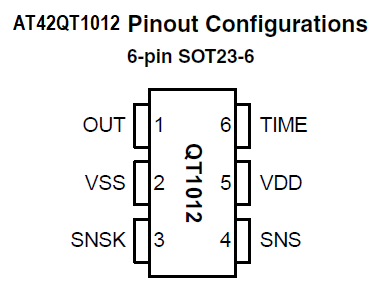 This pin details represents IC AT42QT1012 in 6 pin SOT 23-6 package. Pin 1: OUT – Output state, to switched circuit and output polarity selection resistor. Pin 2: VSS – Ground (GND) supply from power source. Pin 3: SNSK – Sense pin. To Cs capacitor and to sense electrode. 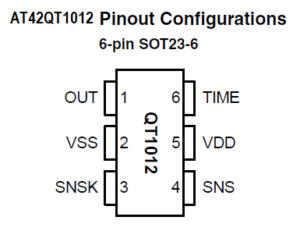 Pin 4: SNS – Sense pin. Pin 5: VDD – Power supply (+1.8V to +5.5V). Here the Cap pad (touch pad) can be built by using copper tape plate or any conducting material, If you Implement this circuit in PCB you can also use track pad as a touch sensor, due to its proximity sense it can detect the touch beyond insulator. You can use single or dual plate if you using dual plate means you need to separate two plates with insulator and one plate should be connected to Ground supply. The capacitor value decides the sensitivity level, higher C2 value increases sensitivity but it take more power and slower reaction time, hence you can choose between 2 – 50nF range. Here the LED is used to indicate the output, you can connect or derive any output actuator through out pin. Ready made breakout boards are available for AT42QT1012, you can avail that if you want plug and play in your prototype. 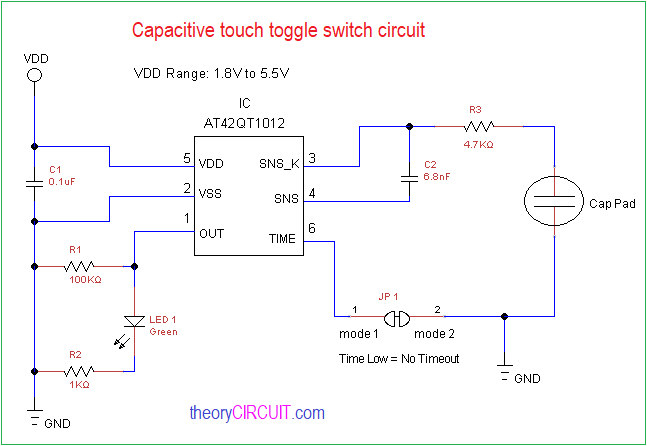 If you need to customize AT42QT1012 then you can refer this Capacitive Touch Toggle Switch circuit.